“School of Rock” coming to St. Norbert College Aug. 10-13, 2017. Next Stage photo. APPLETON — Cori Lang, KHS ’17 grad, is starring in the upcoming production of “School of Rock” at St. Norbert College on Aug. 10 – 13, 2017. Lang plays Rosealie Mullins in the production. She is joined onstage by KHS ’17 grad Trent Hoffman who will be playing Ned Schneebly, KHS junior Dre Benson who will be playing Billy and KHS junior Jacob Van Asten who will be playing Mr. Moonyham. 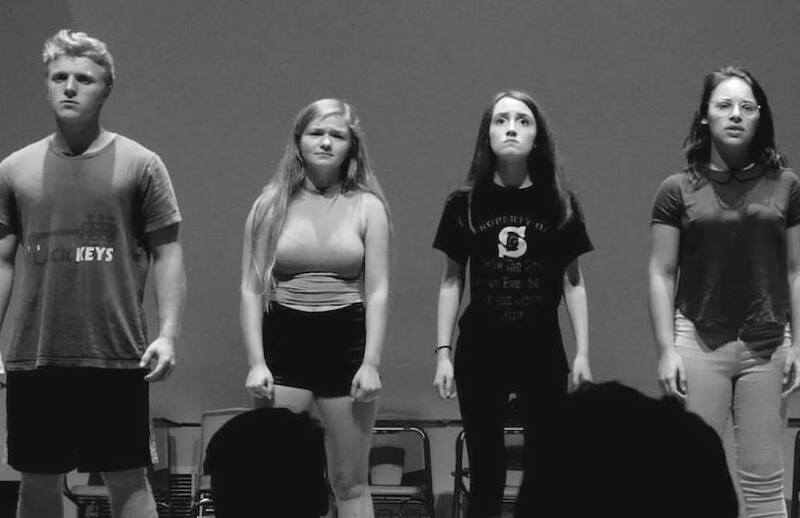 All four KHS students are veterans of the stage, having performed in multiple KHS productions as well as other theatre productions around the valley. Hoffman recently played the role of Joseph in the musical “Joseph and the Amazing Technicolor Dreamcoat,” which was produced by St. Mary’s in Menasha. He played Eric in the KHS production of the “Little Mermaid” his senior year. He will be attending the University of Wisconsin-Green Bay in the fall, majoring in theater. Lang was active in musicals all four years at KHS and played Ariel in the KHS production of the “Little Mermaid” her senior year. Lang will be enrolled in the Honors program at Millikin University this fall, majoring in musical theatre. Lang was also in the Kaukauna Community Players production of “Music Man” this past June, and is the recipient of its annual scholarship. The musical “School of Rock” is based on the 2003 film starring Jack Black. Andrew Lloyd Weber has composed 14 new songs for the stage production, which premiered on Broadway in 2015. “Based on the film of the same name, ‘School of Rock’ tells the story of wannabe rock star Dewey Finn, who poses as a substitute teacher at a prestigious prep school. When he discovers his students’ musical talents, he molds them into an improbable rock group to compete in the Battle of the Bands. The Next Stage summer music theater program is led by St. Norbert faculty members Michael Rosewall (pit orchestra) and Sarah Parks (production coordinator), former Notre Dame Academy choral director Teresa Schmidt (artistic and vocal director) and Notre Dame Academy faculty member Andrea Hearden (choreographer). Next Stage brings together performers and crew members from high schools throughout the Northeast Wisconsin region in a collaborative learning environment. Participants will experience hard work, commitment to the allied music-theatre disciplines and sustained excellence over the full course of a production. Since its beginning in 2015, more than 75 students from 18 different high schools have participated in Next Stage productions. Thursday, Aug. 10, 2017 at 7:30 p.m.
Friday, Aug. 11, 2017 at 7:30 p.m.
Saturday, Aug. 12, 2017 at 7:30 p.m.
Sunday, Aug. 13, 2017 at 2 p.m.